"40-50% of my time is spent with customers so we understand precisely how Render’s technology is used in the field and solve for the very real challenges our industry is facing. I will be developing a shared vision of what customers need and why, so our team can deliver best-in-class customer experiences that transform the way networks are designed and built." says Giesen. 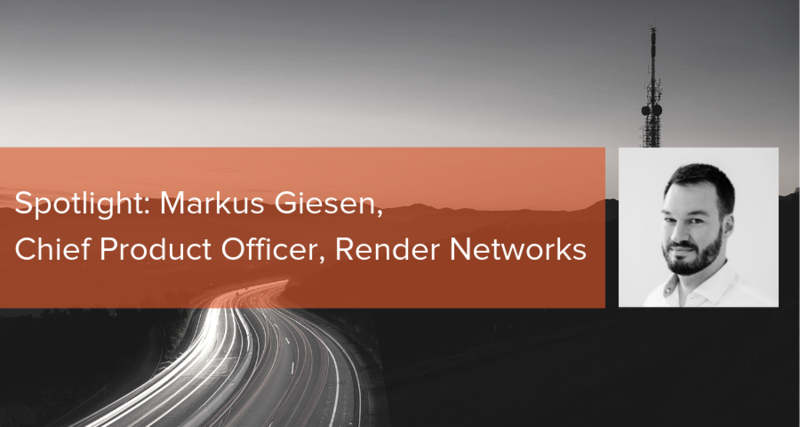 Markus has deep digital software strategy and delivery experience, and will be leveraging his vast Lean UX and enterprise start-up world learnings for the benefit of Render and our customers. Formerly at Deloitte Digital, Markus successfully led the digital team in establishing one of Australia’s largest ISP brands in less than a year, and as Innovation Director created Australia’s first and best-known Innovation Lab for a Big Four bank, delivering digital offerings for the benefit of millions of customers. Markus was a highly respected leader at Deloitte Digital and Co-Founder of the Agile Community of Practice for Deloitte Consulting, overseeing national coaching programs and quality standards. In his new CPO role at Render, Markus will shape the future direction of Render’s platform, establish world-class CX and UX capabilities, and lead a talented group of customer-obsessed analysts and digital product gurus. With Render's presence rapidly growing across USA and ANZ, we’ll lean on Markus’ expertise to delight our customers and team members, design outstanding customer experiences and create human-centered, scalable business processes. Great to have you on board, Markus!